Folk art of the Pennsylvania Germans has always fascinated me. Bird carvings and bird trees always made me smile. The colors and whimsical nature of the carvings really talked to me. My first exposure to Pennsylvania German folk art came in the late 1960's. My wife and I would travel several times a year to Pennsylvania to buy antiques. In the process we became aquainted with many dealers who shared their knowledge and collections with us. It was always the folk art carvings that interested us the most. I knew that someday I would like to try my hand at creating some bird carvings. In 1991 my wife started encouraging me to get serious about my desire to carve. I grew up with a penknife in my pocket and whittled all my life, but it seemed that nothing I started was ever completed. It was amazing to me as I drew a pattern for my first bird carving how everything fell into place. It was a full week before that bird was completed. We called it a "goonie bird." It was very whimsical, not at all like God's birds. I painted it with vivid colors and lots of spots. "That was the beginning." Sixteen years have passed and the carvings have evolved from bird trees to more diversified decorative arts. (We, of course, still have bird trees.) The designs are still basically my own with influence from 19th century folk art. Now there are mirrors, lamps, whirlygigs, and many one-of-a-kind items. Janie, my wife of 55 years is still doing all my decorating. 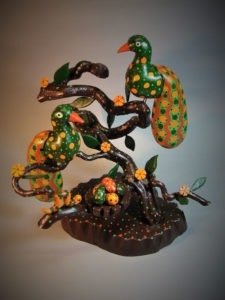 She has worked in many different art mediums, so decorating the birds comes very naturally to her.